Jon Stewart and Stephen Colbert will be back together again. At least for the Republican National Convention. The former "Daily Show" host will make an appearance on CBS' "The Late Show with Stephen Colbert" on Monday night, CNN has confirmed. The show is the first of Colbert's live shows that will cover the presidential conventions. It's not yet known what Stewart will be doing on the broadcast -- or where he'll be doing it from. Yet, those clamoring for Stewart during this crazy election season will undoubtedly be happy to see the comedian return. Not to mention, Stewart's nemesis Donald Trump is the presumptive nominee heading into next week's RNC, which takes place in Cleveland from July 18 to July 21, so Stewart should have plenty to talk about. CBS declined to comment on Stewart's appearance, which was first reported by Vulture. Having Stewart is a bonus for Colbert, who kicks off two weeks of live late night broadcasts from New York's Ed Sullivan Theater during the Republican and Democratic national conventions. Actress Zoe Saldana, Jennifer Saunders, and author Ron Suskind are scheduled to be Monday night's guests. Doing live shows allow Colbert and his staff to comment on the day's events at the convention rather than waiting until the next day. Colbert usually tapes "The Late Show" in the late afternoon during the week. This will not be the first time Stewart has graced "The Late Show" with Colbert. 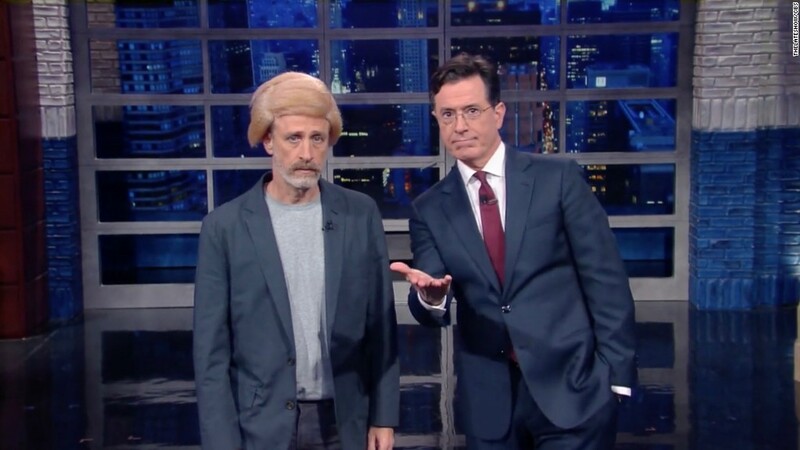 Stewart helped Colbert open the first night in September and in December with a Trump wig. Stewart is also an executive producer on the show.